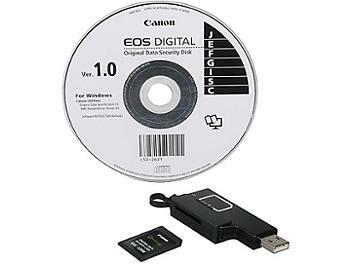 The Canon OSK-E3 Original Data Security Kit for the Canon 1D Mark III Digital SLR Camera is a very secure way to make sure there is no unauthorized use of your files - either by previewing or pilfered on-line (wireless). This system, which requires the installation of included software for your computer (Windows), also comes with a USB card reader/writer that can verify the soundness of your data. In addition, the system has been designed to alert you to which parts of your data have been changed - such as pixels, etc. Imagine how safe you'll feel being able to encrypt your data which can only be decoded via an OSK-E3 system. For those shooting news, art, commercial work or anything that requires even a hint of protection, this system is well worth the cost.